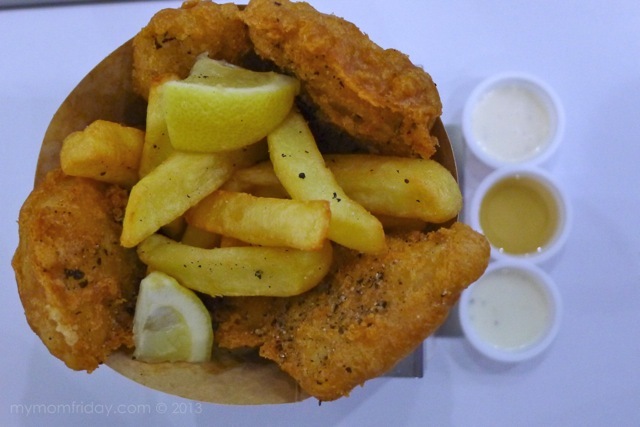 Fish and chips is always a safe choice when I want a light meal when dining out. Before I tried Chuck's Grub a few weeks ago, I can't remember the last time I had some at a restaurant, which means they may be good, but forgettable. Chuck's Grub Fish & Chips made a really good impression and tickled my palette with their freshly cooked specialties. I'm now craving as I look back at my photos here! 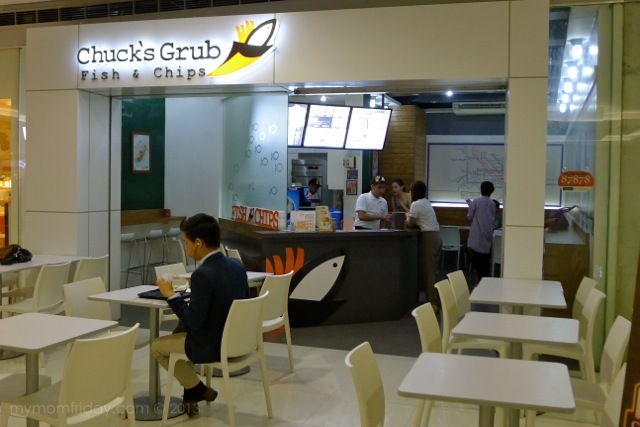 London-inspired, created in Manila, Chuck's Grub Fish & Chips started from a booth at Mercato Central, and now they've grown to six outlets around the metro. 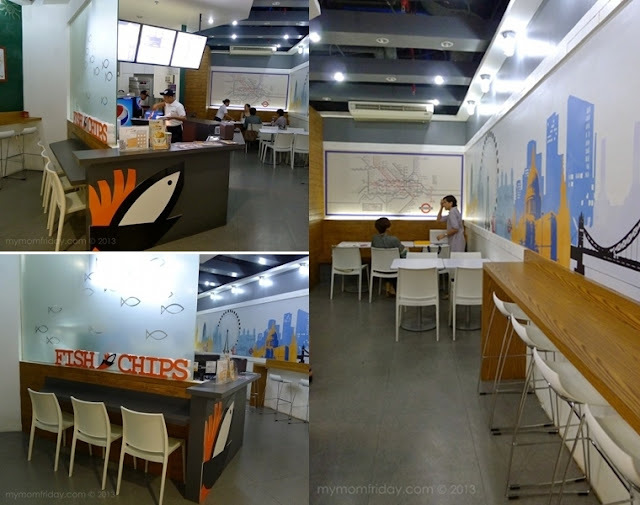 This is their SM Megamall "chippy shop" where I tried my first cone of Chuck's Grub Fish & Chips together with a few of my blogger friends. 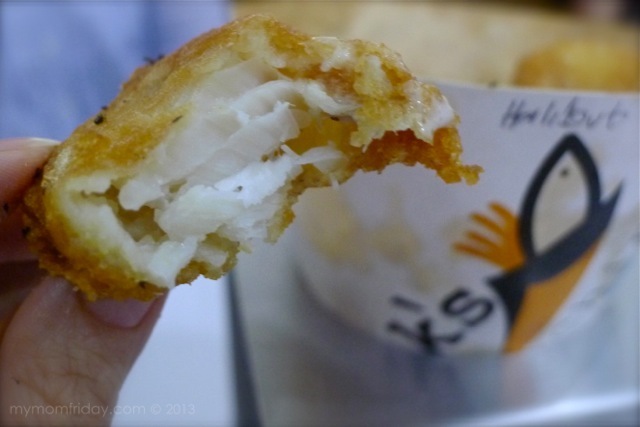 I've been wanting to try their fish and chips for the longest time, but their first few branches were not convenient for me to visit. 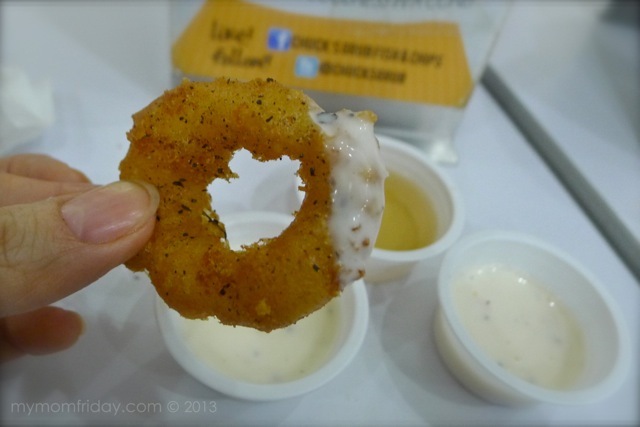 That's why, I was really happy they opened in Megamall. 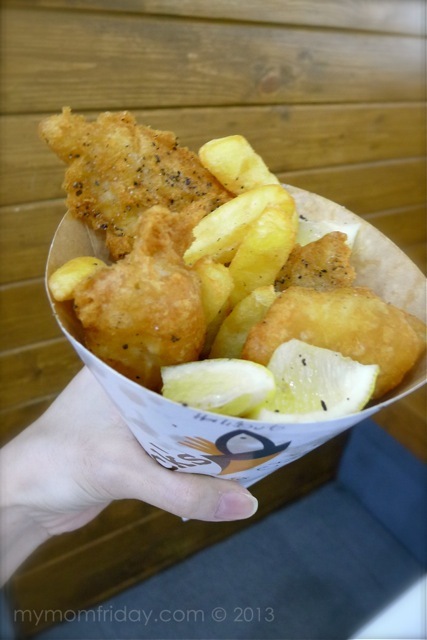 This is as close to authentic as I can get to the popular London street food I only see in the movies - fish and potato fries (chips) wrapped in paper cones. 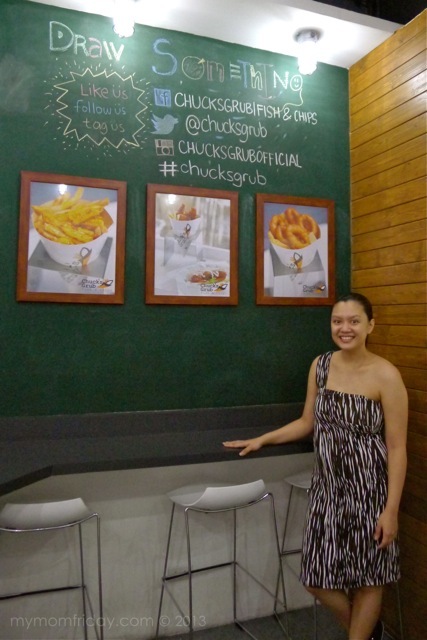 That's Isha Andaya-Valles, half of the power couple behind Chuck's Grub, brainchild of her husband Enrique. I'm not a fish expert, but I do enjoy eating and cooking different types of fish. I prefer the soft, white, flaky types like sole and cod. As a sampler, Isha served us The Full Monty - with four kinds of fish and thick cuts of chips. 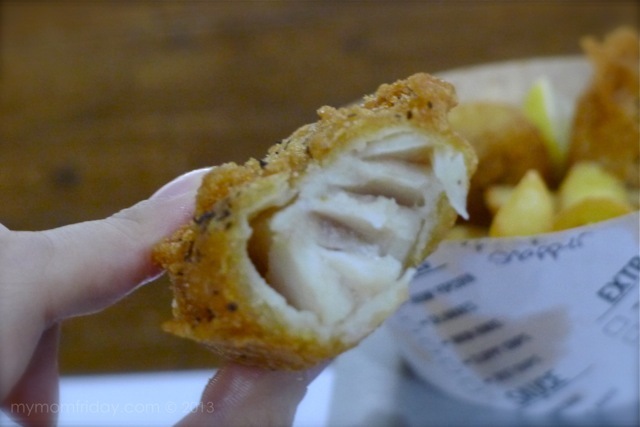 I have to say this now - the fillets were crunchy on the outside, soft and moist inside. 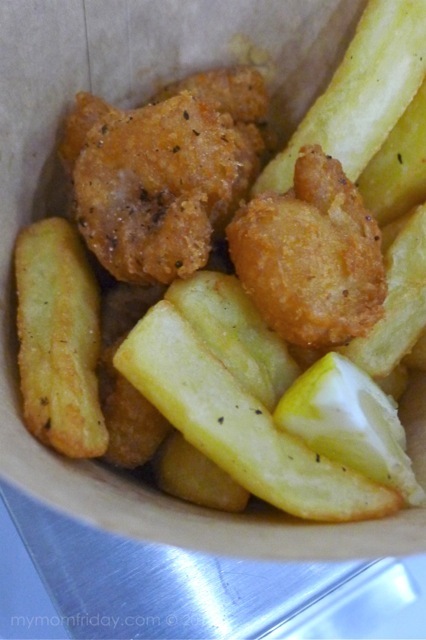 The beer-battered fish fillets were cooked and seasoned perfectly, even the potato fries and sauces were excellent! Each cone comes with lemon wedges too. Everything is made from scratch. Chuck's Grub doesn't compromise on freshness. They know their fish and they cook it really well, so I think that's what makes them the best. I made an attempt to take photos of the fish to show you the difference. When I order fish and chips at restos, I always ask what fish they use. Most common is dory, while some use lapu-lapu fillets. 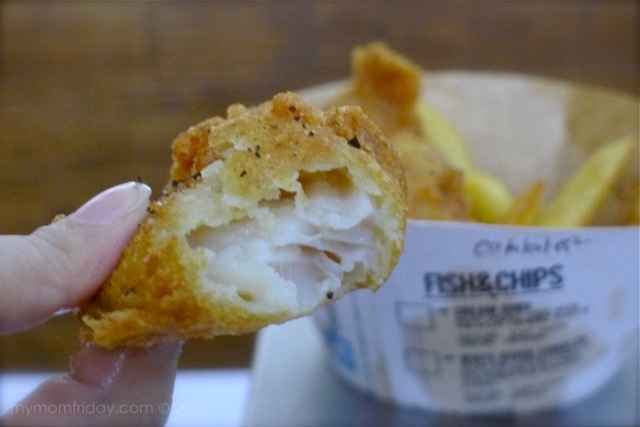 As I've mentioned, I like my fish soft and flaky. Cobbler - poached to perfection, my first time to try this soft melt-in-your-mouth type of fish - it's my favorite among the four. 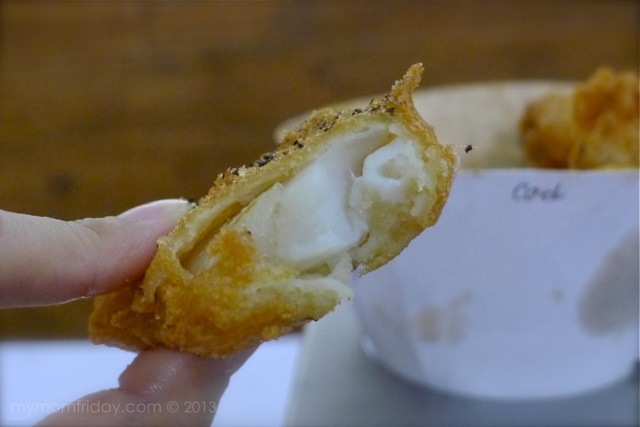 Cod - similar to cobbler, tender flaky fish - this is my second choice. Aside from Fish & Chips, Chuck's Grub serves some equally addicting Nibbles, like these crisp and succulent Shrimp Popcorn and Calamares. I love seafoods so their offerings are up my alley. Writing this post really made hungry! I need to plan my next visit 'coz there's more to try at Chuck's Grub Fish & Chips, like burgers, salads, and rice meals. 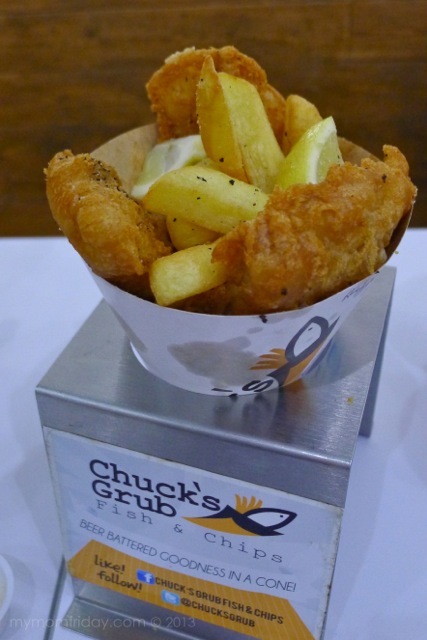 Celebrate National Fish & Chips Day with #chucksgrubfishandchips. 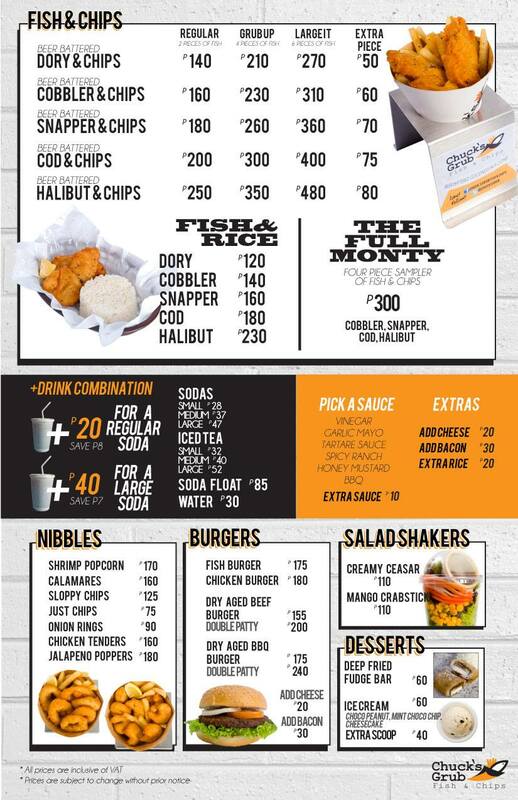 Print the voucher and get more details from Chuck's Grub Facebook Page here and be one of the first 50 people to get one (1) free cone of Beer Battered Dory & Chips!